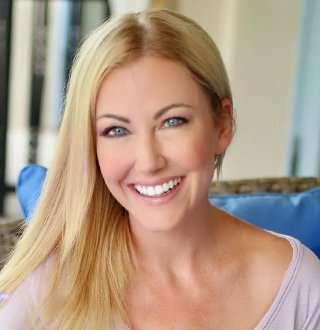 American reality star Stephanie Hollman most recently came clean about her past dealing with an attempted suicide which had stemmed from a failed emotionally abusive relationship. She, however, made a strong comeback, and her relationship with the current husband is now in a beautiful place. The Oklahoma native first rose to prominence after making her debut on hit Bravo TV series The Real Housewives of Dallas(RHOD). Before her rise to fame, she had worked for several charities including the Madonna House Shelter in Tulsa and the Big Brother in Dallas. She stars on The Real Housewives of Dallas alongside a star-studded crew which includes LeeAnne Locken, D’Andra Simmons, and Kameron Westcott to name a few. Born on 13 June 1980, the Real Housewives of Dallas star was raised in a small Oklahoma town. It is my belief that many of the positive values I learned growing up have influenced the decisions I’ve made in my life. Following on her guardian’s footstep, she would later pursue a career in social work herself. After graduating from high school, she enrolled at the Ohio State University to study Psychology. Soon after earning her Psychology degree from the Ohio State University, she went on to work for various non-profit organizations based on Ohio including The Madonna House Shelter and Head Start. The 38-year-old Oklahoma native would continue to work for charities such as The Big Brother and The Family Place - largest domestic violence agency based in Dallas - even after moving to Dallas. Since the airing of RHOD's debut season on 11 April 2016, she has opted to become a stay-home mom and keep her social work career at bay. Bravo on 15 August 2018 premiered the season three of The Real Housewives of Dallas worldwide. Stephanie has an estimated net worth of $18 million. These staggering figures make her the richest housewife among the cast of The Real Housewives of Dallas. The second richest housewife on the show is Kameron Westcott whose net worth is estimated to be around $4.5 million. The Ohio State University alum has her husband to thank for imposing net worth. The show has not only brought her name fame and riches but also shed light on a traumatic period of her life when she was at the beginning of her career. Stephanie relationship with men wasn’t always as perfect as it is right now. In a clip which will be featured on the upcoming episode of The Real Housewives of Dallas - which is slated to release on 22 August 2018 - she opened up about her emotionally abusive relationship when she was 22 years of age. I was with a guy who didn’t make me feel like a worthy person. I never felt pretty enough, I never felt good enough. I was always judged. We broke up and it was like, I lost my friends. And I just couldn’t handle it. I never felt pretty enough, I never felt good enough. I was always judged. We broke up and it was like, I lost my friends. And I just couldn’t handle it. As a measure to put to an end to her troubles, she had emptied a bottle filled with pills by swallowing it all. Moments later, she would tell her mother what she had done, who then called the ambulance requesting emergency help. However, after an attempted suicide, she became a part of a beautiful relationship, which helped lay flowers on the difficult period of her life. Stephanie as of now is happily married to her husband, Travis Hollman for over 10 years And shares two sons named Chance and Cruz from her relationship. Her husband, Travis is the president of the family-owned business called Hollman Inc. -- one of the biggest manufacturer of laminate and wood lockers with an impressive list of clients including Planet Fitness, LA Fitness, Indiana Pacers and Texas A&M to name a few. While her husband looks after the financial aspect of the company, Stephanie handles the company’s charitable works. On 19 April 2018, the Real Housewives of Dallas took to Instagram to wish her husband, Travis a happy 10 year wedding anniversary. Reflecting on her Instagram and her personal life on display at RHOD, it would not be an overstatement to guess that she has come a long way in her life--from a troubled 22-year-old to a happy family woman. The Real Housewives of Dallas Reunion Bound: Who Is Her Brother In Law? The Real Housewives of Dallas reunion is up and running. As expected, it’s brought with it an unexpected face to familiarize within the reality TV world--who is none other than Stephanie Hollman’s brother-in-law, Joey. Fair enough to say, Joey stole the show when he popped out of nowhere in the scene at Stephanie and her husband’s vow renewal. Speaking about Joey's arrival with Bravo's Daily Dish, she shared that his story is actually pretty wild. and she had just met him one and half years before. Adding to that, she exclaimed that Travis never really knew about his own brother till this date, and moreover, confirmed that, Travis and Joey are half-siblings. It is for sure that Joey has managed to created a lot of buzzes all around from his short and sweet role. And fans do want him more in the show! Harry Boomer Bio: Career And Personal Life Details - Where Is He Now? Westworld’s Ben Barnes Kissed Fellow Star, Is He Gay Or Has Girlfriend/Wife? Stephanie Abrams Status After Engaged With Fiance; Married Or Not?